Sonic Jello: 64-channel immersion for the body, belly and brain concert series, at Agora Hydro-Québec, Complexe des sciences Pierre-Dansereau, Coeur des sciences Pavilion (CO-1750), 175 President-Kennedy Avenue, Montreal. 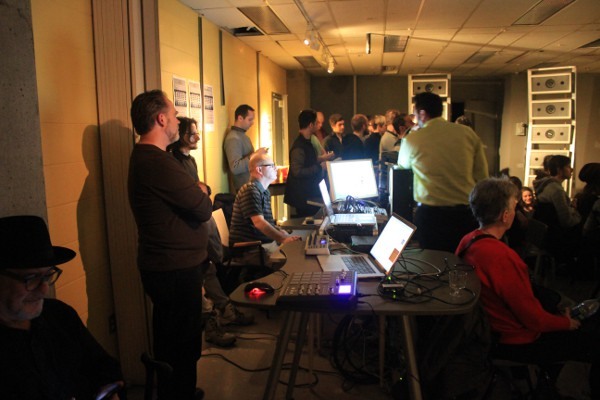 Through the year-long artist residency granted to Steve Heimbecker by the Canada Council New Media Residency program, the School of Media – Faculty of Communication, UQAM, and HEXAGRAM UQAM, seven artist-composers have been working to create a series of new 64-channel sound immersion / spatial music compositions. Sonic Jello: 64-channel immersion for the body, belly and brain is the public presentation of these new and exciting works. 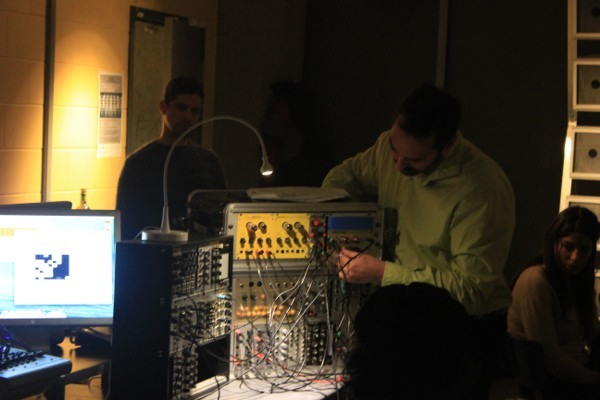 *Steve Heimbecker would like to thank the Canada Council for the Arts, UQAM’s Faculty of Communication, École des médias, Hexagram-UQAM, Sporobole centre en art actuel, MOOG Audio and VR Sonic. On Wednesday June 10, 2015, at 8 PM, Agence TOPO presents another edition of its Sortir de l’écran / Spoken Screen series with RIPALIPER, a new performance from sound artist and composer Steve Heimbecker, at Eastern Bloc, 7240 Clark, in Montreal. Since late 2008, Heimbecker has written nearly 2000 cards comprised of word plays, puns, neologisms and onomatopoeia pertaining to daily events and the changing paradigms of artistic life. RIPALIPER proposes to remix the most recent of these statements translated into soundtracks by software that transcribes letters into sounds. 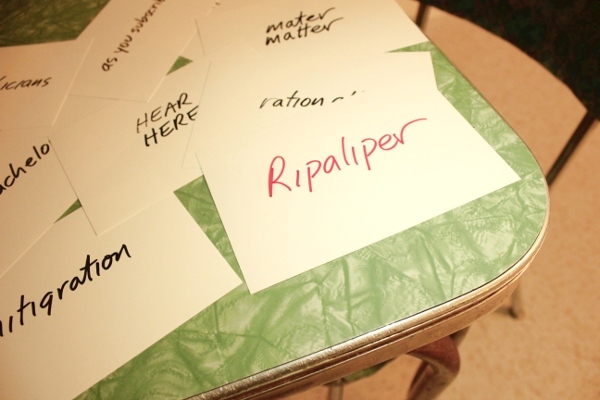 RIPALIPER is a performance where the hand-written notes are projected on the 3 large-scale video screens asynchronously to allow free associations of words, images and sounds, while a multi-channel soundtrack is mixed live in a quadraphonic environment. 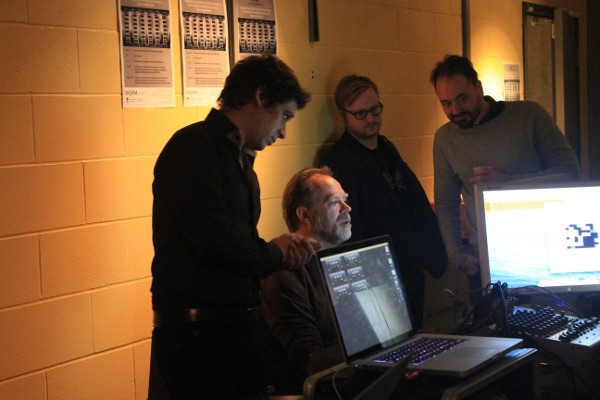 Agence TOPO has provided support to create this project by Steve Heimbecker with the collaboration of MaxMSP programmer Etienne Grenier. Heimbecker’s 5.1 piece La balade longue (2013) was selected for Impromptus 5.1 at Longueur d’Ondes festival which will be held in Brest, France. La balade longue (2013) is composed entirely from stereo and quadraphonic field recordings gathered in and around Victoriaville, Québec in 2007. Steve gave a presentation as part of atelier de scénographie interactive at Agence Topo, Saturday October 4th 2014 describing the the development and concepts of the WORD MUSIC II software: a MAX/MSP which transforms the written word into sound compositions from pre-determined sound libraries created by the composer. – Grant Award – Individual Research and Creation, NOTES, a 52 channel LCD screen AV installation utilizing 1,800 randomly sequenced text based NOTE image words creating a perpetually unfolding audio visual thought poem. Check out Avatar’s 20th anniversary project entitled 40 000 ans for which Steve has proposed a soundtrack, a text and an image called A Circle is a Sphere – click the eye in the lower right corner for the text. Download the entire Avatar project here or consult all 49 projects on the website version. We are pleased to announce that the installation POD has been purchased by the Musée des beaux-arts du Québec. It will be exhibited during the events surrounding the launch of the museum’s new pavilion in 2016. 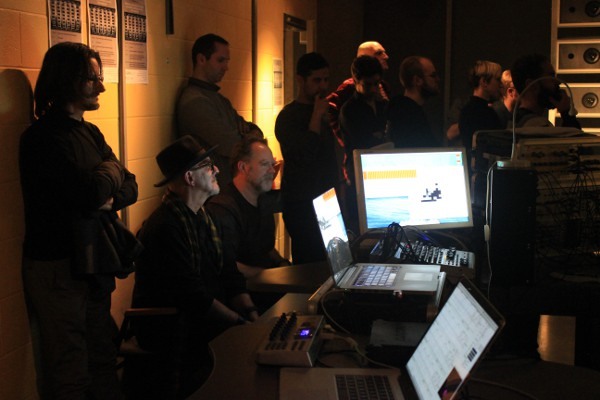 Mixage Fou, an international mixing contest held in Paris has awarded the “Prix Jury Auro 3D 9.1” to Steve Heimbecker for his piece “The Music Lesson” (number 81). 1 – video interview – Qu’est-ce-qui vous amène à la musique électroacoustique?